Business ERP is a fascinating kind of business solution for those smart people who have to keep peace with the modern era. It is awesome software which is designed and modulated to provide a full fledged support to any small, medium and large level of company and corporate clients. 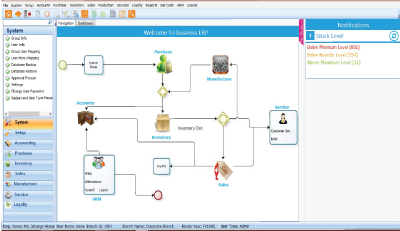 This Business ERP software has been developed using Microsoft, with SQL server 2005 and modeled to perform dynamic official activities in a wink of eye. It takes full liability to perform work of company related to Finance, Accounting, Purchase, Inventory, Sales, Security and many more! It can be installed with easy and can be operated from anywhere of the world. It can work both online and offline and very easy to handle by any one. Any smart executive/ company can rely on it, which can network the entire company, and greatly minimize one's effort, pain, time, confusion and expenses for manual documentation. HRM (Attendance, Leave, Payroll, PMIS). 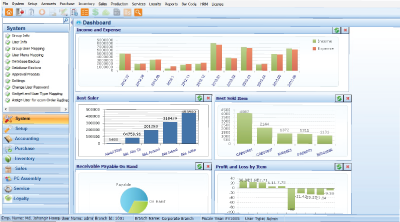 Capability to make report/ dashboard faster than any other tool. Gives top management something that Informative. Management can travel with their reports. A complete end to end ERP solution to manage your business. Significant reduction of workload and improve employee productivity. Fully web based and user can access from any point. 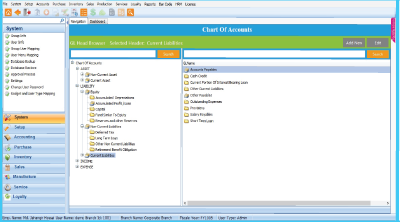 Easy to manage multiple branches, companies etc.